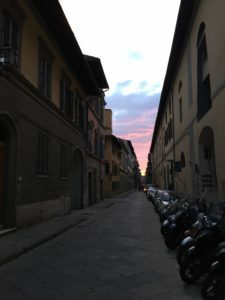 Several years ago, I arrived in Florence on the heels of a life-changing experience, having visited the town in which my ancestors lived, and where several of my extended family members still currently reside. My dad had accompanied me, and was now seeing me off to Florence, where I would spend the next few months studying art history. 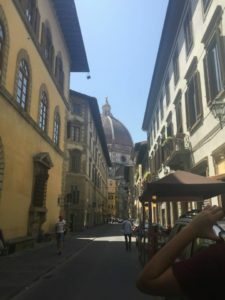 Upon arrival, I was utterly oblivious to the fact that there is no better location in the world to study art history than Florence, Italy. We took the train into Florence’s Santa Maria Novella station, then a tiny taxi from the station to my apartment. The cab driver took us down cobbled streets so windy I had to wonder how cars were even allowed down them. It was a stark difference from the coastal towns where my family lived, with their brightly colored mediterranean plants and architecture overlooking beach views. At the end of a particularly narrow passageway, sat the front door to my building, behind which lay my small, two-story apartment. The place had charm, despite being somewhat run-down; a spiral staircase lead to the second floor, the outer walls were pink, and it had a small balcony overflowing with greenery. But the TV in the living room didn’t work, the kitchen was tiny, and the plumbing was ancient. Despite the inconveniences, this foreign space became a home filled with laughter and shared experiences as my roommates and I adjusted. As evidenced by our struggling home systems, I quickly learned that the age of Italy cannot be ignored in Florence. The cobbled streets and unique architecture press history down upon pedestrians from all angles. A walk through Piazza della Signoria directs the eyes to famous Italian sculptures such as Michelangelo’s David; although a replica of the real David, it sits in the original sculpture’s first home, where it was a symbol of the city’s rebellion against the infamous Medici family’s rule from 1504-1873. Other works of art that tower over the Piazza include Bandinelli’s Hercules and Cacus, Perseo by Cellini, and Loggia dei Lanzi by Orcagna. As the oldest of these works of art, the Loggia dei Lanzi building dates back to 1376. Beyond Piazza della Signoria, Florence’s streets are lined with history, legends and symbolism. The fleur de lis, a symbol of a lily flower, and of Florence since the eleventh century, is hidden throughout the city. There are several legends surrounding the reason the lily was chosen as the Florentine mascot, ranging from the assumption that Florentia was founded by Romans, to the simple fact that Florence’s countryside is abundant with lilies. Whatever the reason, the symbol has been adopted by the city far and wide; even Florence’s main cathedral was dedicated to Santa Maria del Fiore, the Virgin of the Flower, as an allusion to the lily. 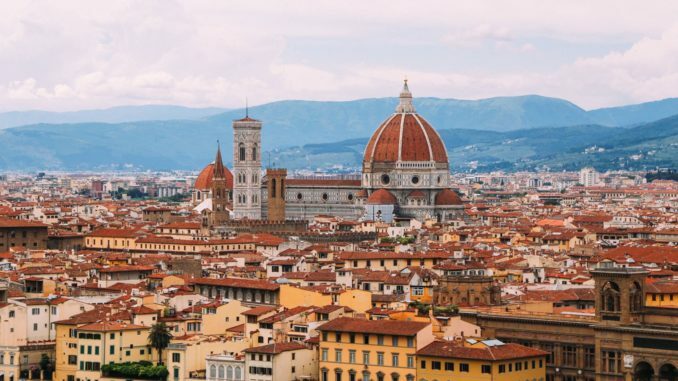 In Florence, classical art also finds its home in several world-renowned museums such as the Uffizi Gallery, the Bargello, Palazzo Vecchio, Pitti Palace, and Museo Galileo. Everything from paintings and sculptures to scientific inventions reside behind these doors. Visitors can learn about the reign of the Medici, discover the symbolism of Botticelli’s paintings, and study the instruments that helped Galileo discover Jupiter’s moons. Extraordinary history and works of art aside, the air throughout Florence is aromatic and palpable with romance. Florentines center their lives around food, family, and a simpler, more leisurely way of life. Dinner is a long, comfortable affair, often taking more than two hours due to ongoing conversation. It’s not uncommon to take a passeggiata, or leisurely walk, after dinner to visit with friends and family around the neighborhood (the word directly translates to “a leisurely walk or stroll, especially one taken in the evening for the purpose of socializing”). Not to mention that the Italian language itself seems to radiate with passion as it enchants the listener. Throughout my time there I found it incredibly easy to fall into the Italian way of life; days passed by lazily but with a feeling of immense contentment as I explored the food, wine and beauty around me. 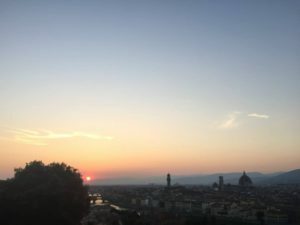 Of all the things I did in Florence, the most magnificent and unforgettable lies at the top of a hill on the south side of the Arno River. Piazzale Michelangelo is a square with an uncontested view of almost the entire city, casting the major landmarks in a stunning light. It’s hard to beat an evening spent waiting for sunset at the square with a bottle of wine. Every evening people gather there to behold the spectacle of the sun descending over the city’s varied and historic rooftops. People often even cheer as the sun slips below the Ponte Vecchio, briefly framing it in a golden glow. As a city, Florence has many talents: just about any restaurant you walk into will have the best meal you’ve ever eaten. The streets have been walked by famed artists and inventors who made history over the years, some of whom are even buried in Florence’s many cathedrals. Impeccable architecture (that was built so long ago it’s hard to believe) forms your surroundings. It’s nearly impossible to leave Florence without falling in love, whether it’s with the city, the food, the scenery, or the people. Speaking from experience, the day you leave, a piece of your heart remains behind, though it will always be there if you ever decide to return to Italy.